It’s time for an election! My name is Rachel Notley, and I am running to be your Premier...again! ...With this incredible team of Calgary candidates! Before I begin, I would like to acknowledge that we are gathered here today on the traditional territory of the signatories of treaty 7. I would also like to acknowledge the Métis people of Alberta, who share a deep connection with this land. Our Cabinet has approved an order-in-council, and it was signed this morning by the Lieutenant Governor. I’m pleased to announce that Albertans will go to the polls on April 16th. Friends, are you ready to fight for an Alberta for everyone! Are you ready to fight for strong public health care for patients and good schools for our kids! Are you ready to fight for an Alberta where it doesn’t matter who you love, to whom who pray, or the colour of your skin -- the only thing that matters is the content of your character! Are you ready to fight for an Alberta where we bring people together, not push them apart! Do you want to keep Alberta – one Alberta – moving forward? And, friends, I can’t wait for the campaign ahead. Let me start by talking about the choice in this campaign and speaking directly to all Albertans. You know, the events of the last few days have really underlined that choice for Albertans. Two days ago, we learned that Mr. Kenney cheated to win his party’s leadership. And when he was caught, he didn’t tell the truth. Mr. Kenney looked Albertans in the eye – and casually and comfortably lied to us. Which, in many ways, goes to the heart of this issue; how comfortable Mr. Kenney is with lying. In this campaign, Mr. Kenney needs to come clean. This issue goes directly to the choice before Albertans. It’s a choice about who is going to be the Premier of Alberta and who is fit to be premier of Alberta? Do Albertans stick together, or do we turn on each other? Jason Kenney wants two Albertas, one for the wealthy and one for the rest of us. He wants two Albertas, divided over people’s rights. This is a man who doesn’t tell truth and whose priorities are fundamentally wrong. I want to build one Alberta. I say we stick together through this final stage — from adversity to recovery to shared prosperity – that we take care of each other. And so as I open this campaign, I would like to speak directly to all Albertans. Specifically, let me talk to you very directly, Albertan to Albertan. If you consider yourself to be a progressive or a moderate voter, I hope to earn your support in this election campaign. We share common values and priorities. Values that Jason Kenney fundamentally rejects. We are the progressive, moderate mainstream of Albertan politics and of Albertan history. We fight for our province and our energy industry — without building firewalls against the rest of Canada. We are on track to balance our budget — without destroying our public services. We help people who need help — rather than just the wealthiest and luckiest. We work to bring people together — not divide people just because of who they are or who they love. We take a sensible, practical, step-by-step approach to progress — not the priorities of extremists and social conservative fringe groups. I hope to earn your support in this election. Let’s team up to keep our province moving forward. If you consider yourself a conservative voter, let me speak to you directly. I hope to earn your support in this election too. A growing number of conservatives here in Calgary and across Alberta are coming to have serious doubts about Jason Kenney as Premier. A nasty record of intolerance should have no place in the Premier’s office. Conservative party by cheating to win its highest office. And then he lied about it. If that’s what you’re thinking as a conservative — that you just can’t bring yourself to give your vote to Jason Kenney to be Premier of Alberta - then this time, in this election, let’s team up to keep our province moving forward. If you are a woman, let me speak to you directly. As we can tell from his many remarks, Jason Kenney isn’t always comfortable with strong women. For example, he doesn’t think we’re good at what he calls “tactical politics”. But if what Mr. Kenney means by that are the kind of politics that won him the UCP leadership, then I wear that badge with pride. And I think we have shown that a government with an equal number of women and men is a government that works for people and that works for families. With your support, we won’t go backwards on our priorities or our rights. If you’re a young person, let me speak to you directly. I believe in your energy, your optimism, your love for this province, and your hope for the future. Like you, I believe Alberta can lead on climate change. Like you, I believe Alberta can provide world-leading education that you can afford. Like you, I believe Alberta can diversify and create good jobs that allow you to build a life right here in Alberta. Oh and the minimum wage...is the minimum wage. There are no second class citizens in Alberta. The last thing young people want is for Alberta to go backwards. So I’m going to work to earn your vote — so that we can keep going forwards. And finally, to all Albertans. If you want to build this province. If you want to act like an owner of our resources and insist that our jobs stay here in Alberta. If you want to ensure our citizens have the best health care and education. If you want honest leadership that brings us all together, instead of looking for ways to drive us apart and that stands up and fights racism. If you want this approach, pioneered by Premier Lougheed and updated and carried forward by my government to keep building our province over the next four years. Then let’s team up in this election to keep our province moving forward. Re-elect me as your Premier. Because my fellow Albertans, I believe our best days are ahead of us and I am fighting for one province with one common future. Because in Alberta, we are at our best when we have each others’ backs in good times and tough times. Nowhere is that more true than right here in Calgary. Calgary is one of the world’s great cities. It was built by ingenuity, grit, and a lot of hard work. But since the oil price collapse, I know these last few years have been tough, they’ve been scary for a lot of families. And I have worked day and night to fight the recession and bring our economy back. That’s why I have thrown everything I have into building new pipelines. I want to thank the people of this city for their unwavering support. When I travel this country fighting for Alberta, I know I have you with me. We’re closer than ever to getting the pipeline built, and I promise you — I promise you — I will not stop until the job is done. Fighting for jobs is also why I have thrown everything I have into diversifying our energy industry. As you might know, I grew up on a farm in northern Alberta and my whole life I listened to conversation after conversation about the need to get more value from our resources. I don’t want my kids – I don’t want your kids – to be having that same conversation 30 years from now. It’s true: my dad and Peter Lougheed went head to head. At times they were fierce political opponents. But they respected each other. They shared a desire to ensure Albertans got the most that they could for the resources we all own. And I think of them often and am inspired by them both. And finally, fighting for jobs - and an Alberta that works for everyone - is why my government didn’t make things worse when oil prices collapsed. We worked every day to make things better. We are building the long overdue Calgary Cancer Centre – so patients get the care they need. We are building new schools – more than 40 here in Calgary – and we are making sure there is a teacher to greet our kids and grandkids at the door. We are building the Green line and expanding the Deerfoot Trail - the transportation infrastructure a city of 1.4 million people needs to keep growing. We are building the new BMO Centre – a new convention centre that will attract billions of dollars in private sector investment to Calgary. And we are protecting this city - the economic engine of this country - from catastrophic floods by building the Springbank dam. Now, I know Mr. Kenney thinks he’s entitled to your vote. But I’m going to earn it. Calgarians will make up their own minds. And I will work as hard as I can to earn your vote. Just as I will fight in this election to earn the vote of every Albertan, by offering Albertans a clear choice and a better future. And, friends, the choice could not be clearer. Mr. Kenney’s plan comes down to this. His plan for the economy — hand out the biggest corporate tax cut in history. His plan for diversification — ignore it. His plan for health care — privatize it. His plan for education — cut it. His plan for new infrastructure — toll it. His plan for our democracy — sell it, break it, and lie about it. His plan for the future — run from it. His relationship to the truth — deny it. Friends, we offer a better approach – a more hopeful approach. Albertans want those pipelines built – we’re going to build them. 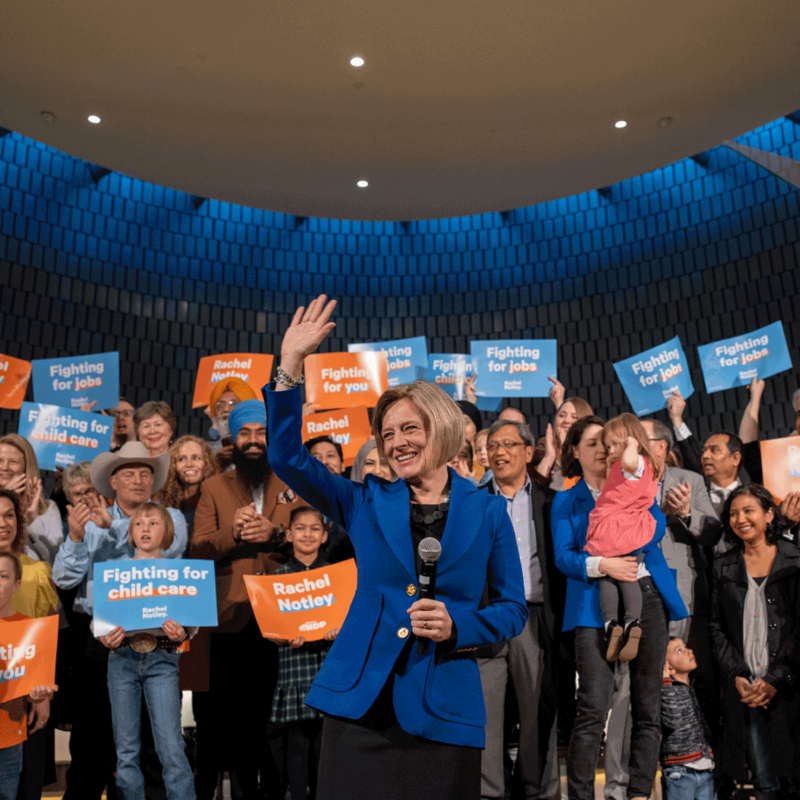 Albertans want our health care to be protected – we’re going to protect it. And when that Calgary Cancer Centre opens, I promise it will be fully staffed and you won’t need a credit card to get in. Albertans want our kids to get the best start in life – we’re going to make sure they do. We are going to expand affordable child care, make sure our kids have good teachers, and that they can afford to go to college and university right here at home. Albertans want to diversify our economy. We’re finally making that happen. And in this campaign I will set out some big, achievable ambitions to create tens of thousands of jobs turning the resources we own into the high-value products the world needs. And in this campaign, I will be laying out our priorities to build one Alberta with one common future. Who is going to Premier, and who is fit to be premier? Because Alberta is for all of us. One Alberta. Not just for the few. But for all of us. And friends I believe Alberta’s best days are ahead...and that the politics of love, hope, and optimism always trumps the politics of anger division and fear. That’s why I am running to be Premier. That’s why my fight - our fight - continues. And that’s why we will keep fighting for you and for all Albertans.